Well, it’s an accusation that the Chief Executive of Global Radio, Stephen Miron, makes of the whole UK commercial radio industry, in an interesting article in today’s Media Guardian. He cites a lack of creative and commercial ambition in the sector, which he believes has resulted in UK commercial radio lacking the essential momentum required to move forward. 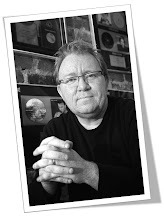 There’s no doubt that Global Radio are ‘on a mission’ to redefine the meaning of ‘local radio’ in 2009, with the next stage of the Heart rollout having just occurred. Whether you think that’s a good thing for the industry or not is a matter of opinion, and time will tell if it’s the right thing to do both in terms of audience and ad revenue. The idea, he says, is to create a commercial rival to Radio 2. "We have advertisers who say, we wish we could advertise on Radio 2. Well now you can - it's called Heart." A R RAHMAN & THE PUSSYCAT DOLLS - Jai Ho! So... the eagle eyed amongst you no doubt spotted that a massive ‘3’ of the songs on Heart’s playlist are also on Radio 2’s playlist 2. That’s around a 10% crossover. Blimey. “It’s practically identical guv’nor”... apart from the 90% difference that is, of course. I won’t even dare to compare the speech content, but it’s suffice to say that today on BBC Radio 2 when Jeremy Vine was discussing the positive environmental impact of water metering designed to help protect limited supplies of water and reduce consumption, Toby Antis on Heart was forward promoting the fact that “Candi Staton’s coming up”. As Chrissie Hynde famously once said.. ‘Don’t get me wrong’... I think Heart is a really strong brand and a fantastically well produced commercial radio station. But sorry Stephen Miron... Radio 2 it ain’t! As the world of radio, online, social networking, mobile and audio entertainment seem to merge daily into an amorphous glob of content, there are always new things that grab your attention. Some of them will be good, and some less good! But here’s something that caught my eye today that I thought I’d share. 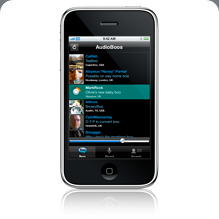 I’m deeply in love with my iPhone and I’m not alone in seeing the potential of Apps and the relevance to today’s radio world. It’s like a mini broadcast platform really! At the moment, it’s still in development phase, and there’s lots of people ‘booing’ things like them whistling, and recording themselves doing a test etc, however, I’m sure over time the users will find the best way to make use of it. As I’m writing this, someone has just ‘boo’d’ (if that's the right phrase) from the stage door of a Lionel Richie gig waiting for Lionel to come out. It was like a little 30 second colour piece by a reporter! Brilliant! Technology has really democratised media hasn’t it. But surely, in the world of radio, we stand a better chance than most of understanding how to make interesting audio that people will want to hear? I can imagine a breakfast / morning show host using this to keep loyal fans in touch with what he or she was doing during the day by recording little ‘boos’ for them. A jock can do a link now whenever they want right into their iPhone, post it, and people will hear it! No more waiting till 6am the next morning!! In the same way as Twitter has worked for celebrities, I wonder if this kind of idea could be of interest to us engaged in the world of radio / online / mobile / audio entertainment... or whatever business you think you’re in currently! 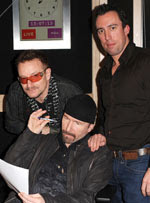 On the flip side to all the BBC hype surrounding U2, it's worth listening to / watching Christain O Connell's interview with Bono and The Edge on Absolute Radio for several reasons. 1. It's just 3 guys sitting around talking about music and 2 of them are talking about being in a really big band. Christain creates such a relaxed atmosphere, you really feel you're eavesdropping in on a private conversation, and and as a result the 'rock stars' feel comfortable to open up perhaps more than they do when their interviewer is hyped up, as is often the case. 2. Absolute Radio understand the power of delivering good content across multiple platforms, so it's nice to see they have bothered to film it properly with a multi-camera shoot. It's still a radio interview... but with decent pictures! Idea. Ambition. Dreaming. Daring. Hoping. Determination. Planning. Excitement. Planning. Tension. Planning. Reality. Quality. Result. Perhaps these were some of the phases that the team at the BBC went through in putting on last Friday’s spectacular event. 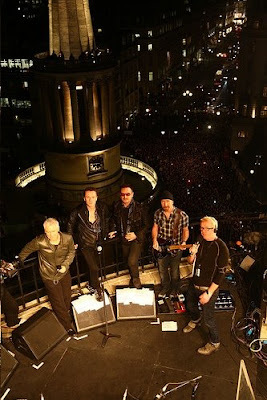 For those who don’t know about it, that small Irish group ‘U2’ played a mini ‘secret’ gig on top of the iconic Broadcasting House on Portland Place in the centre of London, bringing Friday night rush hour traffic to a standstill. Looks good doesn’t it! Now playing on a roof is not a new thing, granted... but back when The Beatles did it, I imagine there was a little less bureaucracy around. These days, getting anything done, anywhere, no matter how small, usually takes forever and a day to sort out. So the logistics and planning involved in actually making this happen are fun beyond belief to imagine! But... sure enough... it happened. Someone somewhere (probably quite some time ago now) said in a meeting “Wouldn’t it be great if U2 played on top the BBC?”. And other people at the meeting said “Yeah – that really would be brilliant! Can we make that happen?” And hopefully the person who had the initial idea said something like “Why not? Let’s give it a go!”. Did the BBC just give U2 the biggest plug for any album release ever in the history of the BBC? Probably. Did U2 benefit? Definitely. Did the BBC benefit? Undoubtably. Did listeners and viewers benefit? Undeniably... the cumulative content was great. A win-win all round perhaps (or perhaps not if you don’t really like U2 and watch / listen to the BBC, as you couldn’t really avoid it if you were in the UK recently). The occasion even has its own mini-site... www.bbc.co.uk/u2 ! Not many bands get that from the BBC! And you know the BBC have got behind something in a big way when they give it its own logo! So, what can we learn from this U2-schmooze fest? 1. Despite the potential enormity of the task, dare to “dream the impossible dream”. Come up with a simple, yet brilliant idea! The point here is not about U2 or the BBC or promotion to the point of undue prominence. It’s about ideas. Having ideas. Believing in ideas and making ideas come to life. Without ideas, we all tread the path of mediocrity. And now go and make it happen.